Athu Oru Kanakalam has all the right ingredients to be a good film, but despite an acclaimed director, an interesting storyline and impressive performances from the cast it doesn’t all come together as it should. The film begins by exploring the issues of class and the pressure of social expectation which is interesting and engaging, but then it loses direction after the interval and the end is basically a disappointment. Srinivasan (Dhanush), nicknamed Cheenu, is the only child of middle class parents and spends his days lazing around with his friends after finishing his degree. He is lazy, spoilt and petulant seemingly as a result of his mother’s indulgence. His father Ganeshan (Delhi Ganesh) is a strict disciplinarian with a tendency to violent outbursts as he berates Cheenu for his apathy and lack of enthusiasm with job hunting. Cheenu insists that he is nothing like his father and is obviously afraid of him, but as we see when he is out with his friends, he has exactly the same violent temper and tendency to strike out when he is angry. Cheenu’s mother is sidelined throughout the film and rarely gets a chance to speak. Mostly she is helpless and unwilling to intervene between father and son. When his parents go away for a few weeks, the family maid Satya (Kalai Rani) is unwell and sends her daughter Thulasi (Priyamani) in her stead. Cheenu and Thulasi were friends as children and while Thulasi is obviously still attracted to Cheenu, he initially doesn’t recognise her. Although younger, Thulasi is more mature than Cheenu. She is also very aware of her social status and despite her attraction to him acts like any proper young servant girl should. On the other hand, he behaves like any typical young man when faced with a pretty girl, and his gauche reactions seem very natural. In the space of the few days they have, they end up falling in love and into a committed relationship –this is the dream period of the film title. Balu Mahendra shows their romance developing in a song and doesn’t spend much time on it. It’s obvious they are in love and Cheenu is determined to marry Thulasi, we don’t need to know any more about it than that. This is a lovely song, and I’m sorry I can’t find a better quality version. Cheenu tells his friends a little about his romance, but doesn’t introduce them to Thulasi and actually hides her in the bathroom when one of his friends visits. He seems ashamed of his relationship with a girl from a lower class. It’s hard to decide if this is also partly because he is trying to hide the relationship from his father as Cheenu is very well aware that he will not approve. The difficulties of an inter-class relationship are well explored and developed despite the initial romance not being given the same treatment, and the pair’s behaviour is realistic in this context. The development of Cheenu’s character here is convincing and Dhanush is believable as the young man realising that he will have to change his ways and actually get a job if he wants to marry against his family’s wishes. Priyamani is exuberant in her role as Cheenu’s lover and the change in her outlook as she realises the obstacles they have to face appears genuine and natural. When Cheenu’s father does discover the relationship his reaction is predictable and dramatic, and Cheenu responds in kind. He vows to marry Thulasi despite the opposition from their respective families and the disapproval of his friends. It looks as if the romance may be the making of Cheenu but before he can follow through with his plans, he ends up in jail after a night out drinking with his friends. When Ganeshan decides to teach his son a lesson and leave him in jail overnight his plans go badly wrong as Cheenu kills another prisoner and consequently receives a prison sentence for murder. I like the fact that although the prison term is obviously a plot point to keep the lovers separated, there is a strong emphasis on the consequence of violent behaviour. Despite the death being an accident, Cheenu has to acknowledge the result of his action and although unapologetic, he accepts that he has to pay for his mistake. From such a promising beginning, the second half of the film loses the realism that kept the story interesting. The director starts to rely on prison clichés with brutal film guards, sympathetic fellow prisoners and a fairly ridiculous fight scene. Naturally there is an opportunity for Cheenu to escape just when he has found out that Thulasi is in dire straits and he absolutely has to go to her. Another problem is that Thulasi’s role is greatly reduced and she only appears on screen to cry and plead with various policemen and prison guards. Priyamani is wasted in these scenes and although she does her best there is very little she can do to make her character less of a caricature. The end is particularly disappointing as the film seems to be building up to a dramatic conclusion that never actually happens. Despite the issues I have with the second half of the film, there are some good points. Dhanush does an excellent job of conveying the fear and trepidation of a young naïve man sent to prison. 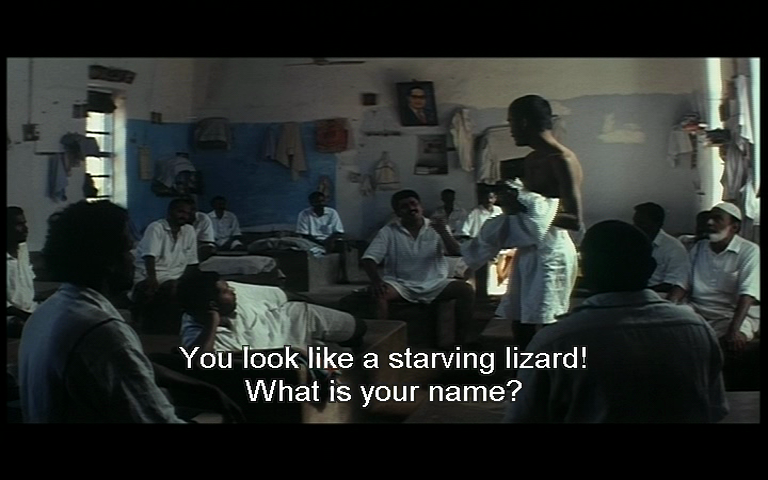 Cheenu’s interactions with the other prisoners are an interesting contrast to his relationship with his father and despite the clichés the prison scenes never descend into farce. There are quite a few jokes referring to the skinniness of Dhanush throughout the film, and most of the humour has a light touch. It is also good to see intelligent police officers who don’t search aimlessly for an escaped prisoner but actually investigate and have a reasonable plan to capture Cheenu. The music by Ilayaraja is beautiful and haunting but is used mainly as a way to show some of the story: the childhood friendship between Thulasi and Cheenu, their romance and Cheenu’s relationship with his mother. One exception is the first song which is a bizarre item number with nothing to do with the story. It is purely an excuse for a skin show from Tejashree with some rather lewd lyrics (even in subtitles) and the film would have been improved by its absence. This entry was posted in Kollywood and tagged Athu Oru Kanakalam, Balu Mahendra, Dehli Ganesh, Dhanush, Illayaraja, Kalai Rani, Priyamani, Tejashree. Bookmark the permalink. I’ll keep in mind your reservations for the second half when I watch. Thank you for blogging about this one! Perhaps I just had too high expectations from this one? It’s really not a bad film and if you ignore the item song and just accept the ending then it’s actually pretty good. This came up in my netflix queue, and I was pleased to see that you’d reviewed it. I really liked both Dhanush and Priyamani in this, and agree that the 2nd half wasted the potential of the first half. After the fantasy sequence at the beginning, I wasn’t sure if the later romantic scenes were fantasy or reality. Also, Dhanush is so scrawny, and I love that they commented on that several times. 😀 I thought the way they kept referring to his physique was very funny! I think this was released not long after Dhanush got reviews for Sullan that said he couldn’t be an action hero because he was too thin so I wonder if some of this was a reaction to those critics? It makes me laugh though because he really is very skinny here! I personally like these kinda dark films – mainly because they remain etched in our hearts, and will continue to stay forever. Not so long ago, I came to know this film was inspired from the director’s previous ventures Yatra and Nireekshana/. Though Dhanush and Priyamani looked convincing, I feel the film had come at a wrong time. 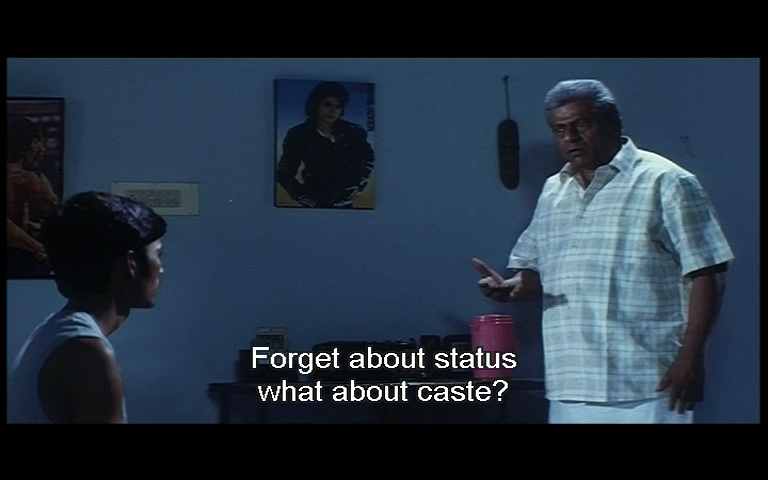 Perhaps, Balu should have made this with Kamal right after Moondram Pirai. Have you watched those two films? I’m unable to figure out which one came out first. It looks quite obvious that Yatra was made in ’85, but Nireekshana is claimed to have come out in either ’82 or ’86.